Between Caldicot and Uskmouth and then again between Duffryn and eastern Cardiff the landscape is more akin to the Netherlands than most people's perception of south Wales. The Caldicot and Wentloog Levels comprise two areas of low-lying alluvial wetland and intertidal mudflats either side of the River Usk estuary at Newport. The Caldicot Level lies to the southeast of Newport between the River Usk and River Wye and consists of 17,500 acres. It is home to Newport Wetlands Reserve. The Wentloog Level lies to the southwest between the River Usk and River Rhymney and consists of 8,500 acres. The levels are extremely rich archaeologically, with finds from the Mesolithic, Bronze Age and Iron Age periods. One of the most significant finds was of a 3rd century Romano-British boat found near Magor. A large number of Anglo-Norman sites including castles, churches, court houses, manor houses, moated sites and watermills show near-continuous occupation throughout the Middle Ages. The levels are entirely man-made, having been reclaimed from the Severn Estuary since Roman times. As such, the levels are criss-crossed by artificial drainage channels, known locally as 'reens' managed by the Caldicot and Wentlooge Levels Internal Drainage Board. 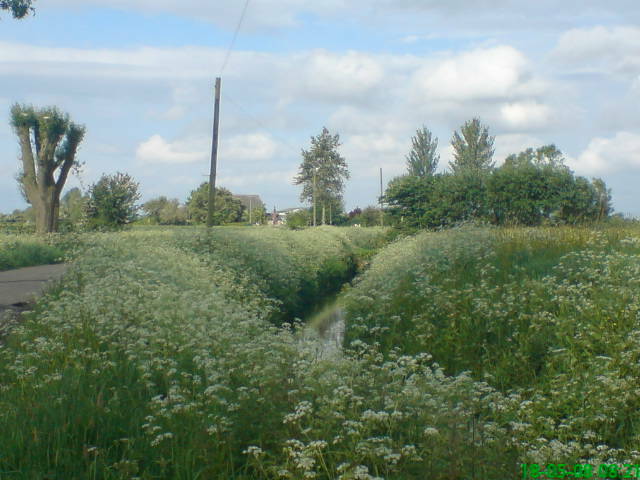 Spelt RHYNE in England and REEN in Wales, a more common description would be a ditch. Reens have several purposes. In addition to their primary function of conveying water, they also act as storage for a dual purpose. To hold water in the summer months to help stop adjacent ground from drying out. This is in the interests of nature conservation, agriculture, aesthetics and the structural stability of the ground. 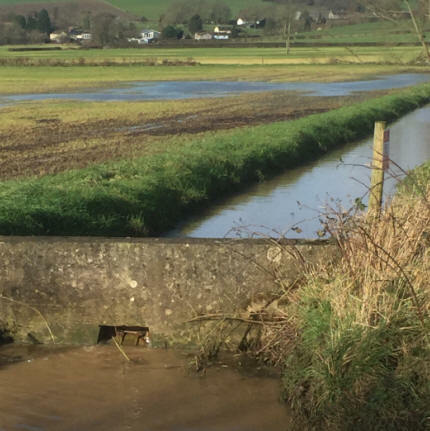 The reen system on the Caldicot & Wentlooge levels (or any other level) has the primary function of moving water "from field to sea" during the wettest months of the year. Without this system, thousands of acres of prime agricultural land, homes and business would be flooded on a yearly basis. The extensive saltmarshes that fringe the south coast of Newport were first drained during Roman times, probably by legionaries based at the fortress at Caerleon, to increase the area of good agricultural land. The remarkable pattern of long narrow fields created by drainage ditches on the Levels near Newport was first recognised in the 1980s, but it was only through recent excavations that a Roman date was firmly established. The ditches were found to extend into the inter-tidal zone of the Severn Estuary, where they contained stratified Roman pottery and animal bones, dating the system as a whole. What makes this landscape of great importance is that it is still in use today, probably the only example of an intact Roman drainage system in Britain. during the post-Roman period most of the Levels were flooded, apart from the area near Cardiff where the Roman drainage system remained in use. However, because of the potential fertility of the soil, the Levels were soon re-enclosed by sea walls to prevent further tidal flooding. Following the Norman conquest of southern Wales, the `Marcher' lords started settling their newly acquired estates, including the Levels, with English tenants. In south-west Wales, the English often made use of Flemish entrepreneurs to create new villages. In the Levels, there is no direct evidence for Dutch or Flemish involvement, but one planned village, Whitson, does show similarities with a system of reclamation used in Holland, known as the `cope'. In this system, farms were laid out in a single line on slightly elevated land, with the tenement plots stretching out, in a distinctive manner, in long strips towards the lower ground. In 1531, Henry VI set up Courts of Sewers to improve drainage, but without any powers to oblige landowners to carry out work. In 1884, the Caldicot and Wentlooge Level Act established a new body, the Monmouthshire Commissioners of Sewers, with responsibility for maintaining sea walls and roads in the Levels. The long title of the Act is "An Act to provide for the commutation of the liability of Landowners in the Levels of the hundreds of Caldicot and Wentlooge in the County of Monmouth to maintain sea walls and other works to provide for the making and maintaining of roads in the said Levels and for other purposes." This was superseded by the Caldicot and Wentlooge Levels Drainage Board in 1942. A 1995 CADW study has shown that different landlords exploited their estates in different ways. In the east, towards Chepstow, there was a pattern of nucleated settlements around small village greens, surrounded by open fields, as at Redwick. This area was in English hands; and it contrasts sharply with the dispersed settlements and enclosed fields seen to the west, south of Newport, which was held by Welsh lords. Large areas were granted to monastic houses, such as Goldcliff Priory and Tintern Abbey; and they too managed their estates in ways that can still be discerned in the landscape. Goldcliff established two planned villages, but largely seems to have allowed its existing tenants to manage their land as they pleased. Tintern, on the other hand, managed its estates directly, with each block of land containing a single farm. The Black Death hit south-east Wales hard, with certain manors almost totally depopulated. From the 14th century, the coastline also suffered severe erosion, leading to the sea wall having to be set back several hundred metres - the present wall cuts through earlier fields which must once have extended further out to sea. The increasingly wet climate would have made the heavy soils more difficult to plough, but with some of the most fertile agricultural land in the region, the Levels were not abandoned. The communities there specialised in pastoralism, taking advantage of their proximity to the expanding market and port of Bristol. Thus, while many settlements on the adjacent uplands were deserted, communities on the Levels continued to flourish. The last major phase in the creation of the present landscape was the enclosure of the commons and open fields in the 19th century. However, by that time, more destructive processes had begun, as the industrial and urban areas of Newport and Cardiff spread onto the Levels. As indicated above the Levels have been totally hand-crafted by man. They were created through the enclosing and draining of tidal saltmarshes, and are still dominated by the need to manage water. Without sea walls, all the Levels would be frequently inundated by the sea. Another constant problem is managing rainfall and run-off from the uplands, which is dealt with by a complex system of channels that carry water off the surface of fields ("ridge and vurrow"), into large gullies ("grips") and into the network of field ditches. Water then drains from these into major. This network is the key feature of the Levels, both in terms of their ecological importance and the historic landscape. Interestingly, the pattern of reens found on the Caldicot Level has been complicated by the construction of the Newport Wetlands Reserve. Whereas the raison d'etre of all previous reens and ditches had been to drain the land, the aim of the network of new waterways constructed as part of the reserve has been to keep the land flooded, albeit with fresh water!